Following the French Grand Prix, Formula One popped up in Spielberg located in the scenic Styrian mountains. The beautiful country of Austria has a long history with a few interruptions in the Grand Prix history. This will be the 31st Austrian Grand Prix. THe first ever GP was held near the Zeltweg airfield in 1964. Despite to its success, F1 did not return because it was deemed too dangerous. The grand prix returned in 1970 at the almost 6kmlong Österreichring, which hosted the race until 1987. Austria then hosted its next GP in 1997 on a shortened layout. The venue fell off the schedule once again in 2003 before returning in 2014, bearing the name Red Bull Ring. Among the race stewards will be Garry Connelly and Derek Warwick. Both take on this role frequently. The duo will be supported by Silvia Bellot. The Spaniard began marshalling in 2001, when she was 16. In the years that followed she acted as a steward in a number of national and international series. She made her first appearance as a Formula 1 steward at the 2011 Turkish GP and in 2012 was awarded the FIA’s Outstanding Official prize. Four-time F1 world champion Alain Prost is the most successful driver at the Austrian Grand Prix, with three wins to his name. McLaren are the most successful team at this race, with six wins. Of the current drivers on the grid, only Lewis Hamilton and Valtteri Bottas have previously won this race, with Briton Hamilton winning for Mercedes in 2016 and Finland’s Bottas scoring the second win of his career here last year, also for the Silver Arrows. It is cruel irony, but Red Bull is yet to triumph on its own circuit. Niki Lauda, René Arnoux and Nelson Piquet share the record for most Austrian Grand Prix pole positions, with three each. Coulthard holds the record for victory from furthest back on the grid on this layout. The Scot’s 2001 win for McLaren was delivered from a starting position of seventh. Among the main sponsors of the Austrian Grand Prix are Memphis, Raiffesen and A1. The 2018 Austrian GP will be sponsored by Eyetime. It is an innovative social life app, one of the most avant-garde communication tools currently available on the digital market. With its state-of-the-art encryption and worldwide connectivity, eyetime meets all of its users’ needs, whether in private or professional communication. Last year’s GP was won by Mercedes’ Valtteri Bottas. However, the Finn’s advantage to the second-places Sebastian Vettel was only 0.658, making the end of last year’s race a thiller. 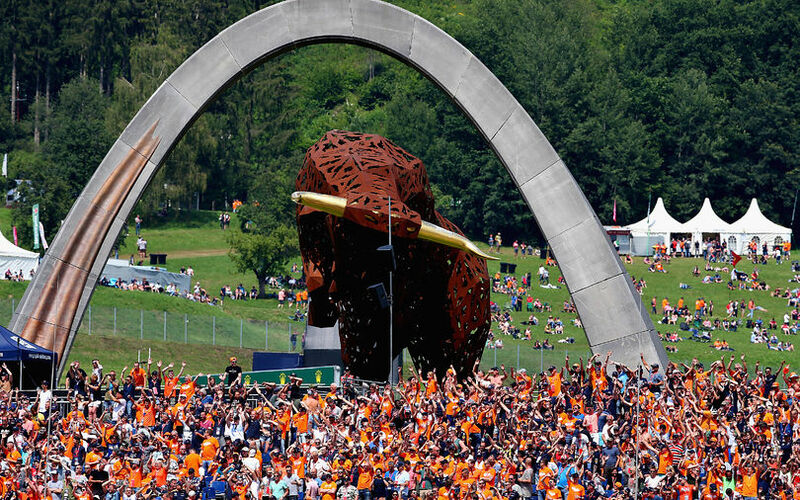 Red Bull Ring plays host to MotoGP, DTM and ELMS 4 Hours Race next to the Formula One’s Austrian Grand Prix. Over the last decades, Bon Jovi, The Rolling Stones and AC/DC all held concerts on the circuit. Austria has a long and rich history. Modern Austria is the German-speaking part of the Austrian (later Austro-Hungarian) Empire ruled by the Habsburg family from 1526 to 1918. When visiting Austria's capital, Schönbrunn Palace is the first choice for tourists. The beautiful building was the summer palace of the Habsburgs, has no less than 1,440 rooms. The oldest zoological garden in the world is the Tiergarten Schönbrunn in Vienna, founded in 1752. Austria is the only continental EU country that is not a member of NATO. Austria has a long list of famous people from very different area of life. The founder of the German sports car company 'Porsche' was the Austrian Ferdinand Porsche. He also designed the Volkswagen (the "people's car"). The father of psychoanalysis, Sigmund Freud, was Austrian. Arnold Schwarzenegger, former Hollywood actor and current governor of California, grew up as an Austrian citizen. Austria has given the world many famous classical music composers, including Haydn, Mozart, Schubert, Liszt, J. Strauss, Mahler, and Bruckner. The sewing machine was invented in 1818 by Josef Madersperger, an Austrian. About one fourth of the population of Austria lives in the capital, Vienna. Austria is one of the main destination of tourists because of its natural wonders. 62% of Austria's total land area is covered by the Austrian Alps. Austria has 13 peaks above 3,000 metres, and 34 above 2,000 metres. Europe's second highest peak in order of prominence, Großglockner (3,798m, with a prominence of 2,423m) is located in Austria. Among Europeans, Austrian people work the longest, with an average of 45 hours per week.